Bride of The Water God (Hangul: 하백의 신부 2017; RR: Habaekui Shinboo 2017; lit. 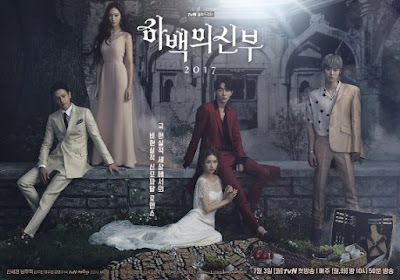 Bride of Habaek 2017; A.k.a: The Bride of Habaek) is a South Korean television drama spin-off of the 2006 sunjung manhwa Bride of the Water God by Yoon Mi-kyung. The drama stars Shin Se-kyung, Nam Joo-hyuk, Lim Ju-hwan, Krystal Jung and Gong Myung. It currently airs on cable channel tvN every Monday and Tuesday at 22:55 (KST) starting from July 3, 2017. Plot: When the narcissistic water god Ha-baek (Nam Joo-hyuk) visits earth in order to find a stone powerful enough to help him claim his throne, he seeks out the help of his servant and destined bride, psychiatrist So-ah (Shin Se-kyung), whose family is fated to serve the water god for generations. The problem is that she has no belief in the gods and initially mistakes him for suffering from delusions. Things get even more strange, however, when the wind god Bi-ryum (Gong Myung), the water goddess Mu-ra (Krystal), and the demi-god Hu-ye (Lim Ju-hwan) show up to complicate things.